As we all know that kinetic energy can be converted into electricity that can be useful for powering up mobile devices while on the move. But have you ever wonder that probably with little creativity and innovation, you may able to come out with even much simpler product to make use of kinetic energy (that otherwise wasted) to convert to electricity to recharge batteries while performing some daily work or exercise? 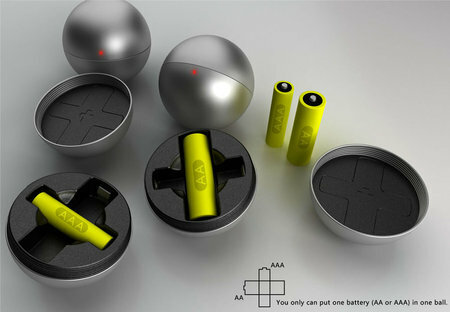 A good example here, Jiang Qian, a Shanghai based designer has designed a unique baoding ball that utilizes kinetic movement which transform the energy into electricity to recharge batteries while being rolled in the users’ hands. Baoding ball, or better known as Chinese exercise ball is able to exercise your finger and hand and more importantly, it is believed to have similar effect of acupuncture which stimulates your acupuncture points for better health and life. And good thing now, while you are playing with the baoding ball when watching the TV, reading book or doing nothing, you are actually able to charge up either AA or AAA size batteries without really realizing it. There are even LED indicators on the ball surface to inform you if the battery charging capacity is already full or still needs some more exercise. No pricing and availability yet, this is definitely a brilliant idea on how to reuse energy without consuming extra of what we normally do.